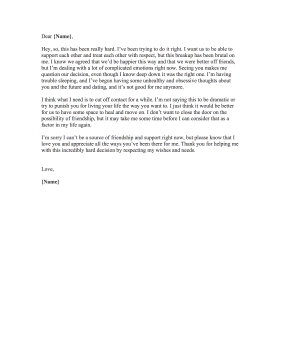 Let an ex-partner down easy when cutting off contact with this personal rejection letter that cites complicated emotions for creating distance. Hey, so, this has been really hard. I've been trying to do it right. I want us to be able to support each other and treat each other with respect, but this breakup has been brutal on me. I know we agreed that we'd be happier this way and that we were better off friends, but I'm dealing with a lot of complicated emotions right now. Seeing you makes me question our decision, even though I know deep down it was the right one. I'm having trouble sleeping, and I've begun having some unhealthy and obsessive thoughts about you and the future and dating, and it's not good for me anymore. I think what I need is to cut off contact for a while. I'm not saying this to be dramatic or try to punish you for living your life the way you want to. I just think it would be better for us to have some space to heal and move on. I don't want to close the door on the possibility of friendship, but it may take me some time before I can consider that as a factor in my life again. I'm sorry I can't be a source of friendship and support right now, but please know that I love you and appreciate all the ways you've been there for me. Thank you for helping me with this incredibly hard decision by respecting my wishes and needs.